So, you think the world is falling apart at the seams, but all you’ve really been doing is yoga? Apparently you’re not alone. 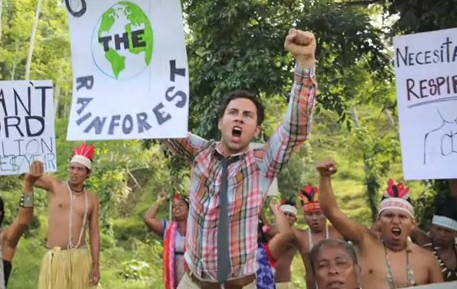 This funny video, Follow the Frog, has so far mustered well over a million views on YouTube, so its message that you don’t have to be an eco-warrior going to the ends of the Earth to save the rainforest (“Siri, I want to go home!”), has certainly struck a chord. Follow the Frog was made for the Rainforest Alliance in 2012, and has since been nominated for a People’s Voice Webby award, and won Best Nonprofit Video in the DoGooder Nonprofit Video Awards. According to the Rainforest Alliance, the frog seal shown in the video means that only farms that meet rigorous sustainability criteria earn the right to use the Rainforest Alliance Certified seal. The certification criteria include environmental protection, social equity, and economic viability. The farms are chosen by independent, third-party evaluators. Sounds like it’s definitely a good idea to start following the frog, if you want to help save the rainforest, without becoming an adventurous activist.